For practical purposes, recycled PET (washed flakes from post-consumer PET bottles) can be used for making any of the following products. Fiber fill denotes applications where short fibers are used to fill cushions, pillows etc. POY (partially oriented yarn) is another type of polyester yarn that is used to produce texurized yarn that goes into making fabrics. Even though all these products are feasible from recycled PET, there are some technical issues that dictate the use pattern. The washed flakes typically have an internal viscosity (IV) in the range of 0.6-0.75. As can be seen from the table below, PET used for making bottles, sheets, masterbatch etc., has to have a higher IV. This gap (in IV of washed flakes and bottles) can be bridged by subjecting the washed flakes to an additional step (of solid state polymerization, which increases the molecular weight of the polymer and hence the IV of the resulting material). This involves an additional cost. 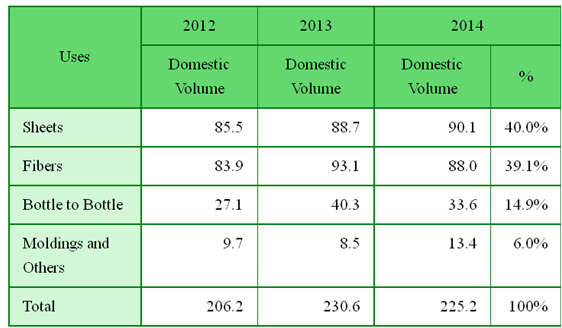 The following figure gives the breakup of how recycled PET is used in the US. 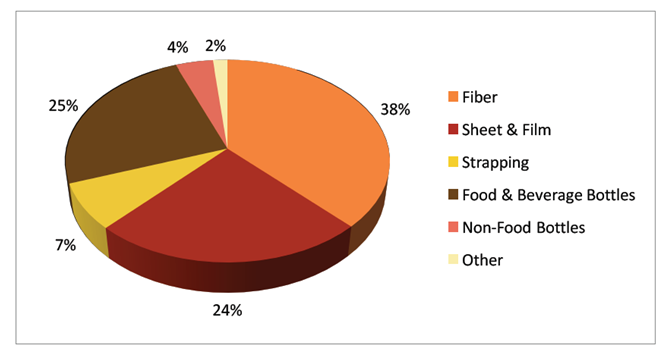 As can be seen apart from fiber and sheet applications, 29% of recycled PET goes into making bottles (food and non-food applications). 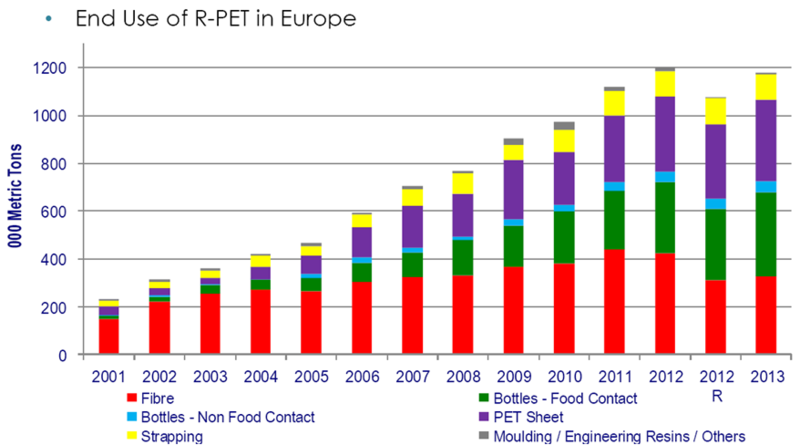 The chart below provides data on how recycled PET has been utilized in Europe over the last decade. Recycled PET is roughly used equally in making fibers, sheets and bottles (predominantly in food contact applications). In Japan, recycled PET is predominantly used in making sheets and fiber applications, with a small percentage (~15%) going into making bottles.